The president met with British Prime Minister Theresa May Thursday and held a joint press conference where the two discussed Brexit, Russian leader Vladimir Putin, the U.S.-Mexico relationship, and torture. President Trump and Mexican President Enrique Peña Nieto spoke on the phone for an hour Friday morning amid rising tensions over Mr. Trump’s proposal for a southern border wall, a White House official confirmed to CBS News. Mr. Trump and Peña Nieto were supposed to meet in Washington next week, on Tuesday, but the Mexican president said Thursday that he was canceling the visit after Mr. Trump moved forward with plans to construct a wall along the U.S.-Mexico border and have Mexico pay for construction. President Trump will speak with Russian leader Vladimir Putin over the weekend, senior White House adviser Kellyanne Conway said in an interview Friday. Conway confirmed to “CBS This Morning” that it would be taking place Saturday. Anti-abortion protesters march in Washington just shy of a week after the women’s march on Washington last Saturday, and the president is expected to call in to voice his support. Vice President Mike Pence and top adviser Kellyanne Conway are also addressing the movement. President Trump said he would be in favor of deploying the so-called “nuclear option” if his Supreme Court nominee gets blocked in the Senate, meaning that he would back a change in rules to allow a simple majority vote to push through his chosen justice. “Would you want [Senate Majority Leader] Mitch McConnell to use the nuclear option?” Fox News’ Sean Hannity asked the president Thursday. “Yes, I would,” Mr. Trump responded, citing Democrat “obstructionists” in the Senate. President Trump spoke directly over the phone Saturday with the National Park Service (NPS) chief following his inauguration -- the same day the White House aired grievances about reporting on crowd sizes at the historic ceremony. A National Park Service spokesperson confirmed to CBS News that Michael Reynolds, the acting NPS director, had a phone call with Mr. Trump over the weekend. The Washington Post first reported on the direct communications between the two. President Trump is expected to sign a executive action related to national security at 4:30 p.m. at the Defense Department. President Trump threatened to cancel a meeting with Mexican President Enrique Peña Nieto that was supposed to be next week, following the foreign leader’s statements Wednesday night that he was reconsidering his visit to the United States. But then Peña Nieto beat him to the punch. Congressional leaders are considering legislation to fund President Trump’s proposed wall along the U.S.-Mexico border -- House Speaker Paul Ryan told MSNBC’s Greta Van Susteren Congress would front the money. In an interview with The New York Times published Thursday, Stephen Bannon said that the media is the “opposition party” of the new administration and “should be embarrassed and humiliated” by the unanticipated election result. White House spokesman Sean Spicer said Thursday President Trump is proposing a 20 percent tax on imports, particularly on products and services from Mexico, so that revenues could be used to pay for the construction of Mr. Trump’s proposed wall along the U.S. southern border. What does the U.S. import from Mexico? Later in the afternoon, however, Spicer and White House chief of staff Reince Priebus told reporters that the proposal was in fact just one of several options the White House was considering, including a border tax in the range of 5 - 20 percent. “It is part of a buffet of options,” White House chief of staff Reince Priebus told reporters, according to CBS News’ Margaret Brennan. Mr. Trump headed up to Philadelphia to visit the Republican House and Senate retreat. 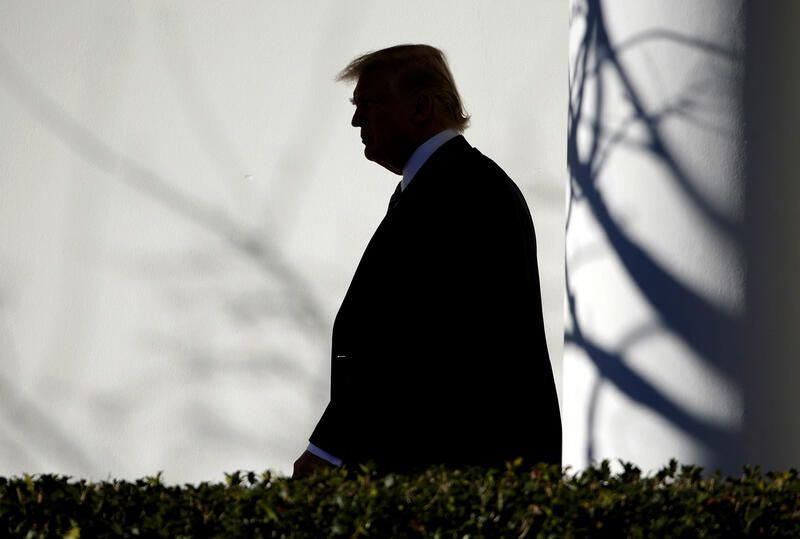 He began by ribbing Republican leaders about their pre-Trump electoral losses and then touched on a number of topics, including his executive actions. The president also charged that Manning had called former President Obama a “weak leader,” though the transgender soldier -- whose prison commutation was one of Mr. Obama’s last acts in the Oval Office -- didn’t exactly say that. At the Pentagon, Mr. Trump signed two executive actions -- one on “extreme vetting” and another on rebuilding the military. “I’m establishing new vetting measures to keep radical Islamic terrorists out of the United States,” the president told an audience at the Pentagon Friday. Mr. Trump was initially expected to roll out an executive action on voter fraud today, but that has now been postponed and the timing for its release is unclear. “It will be a follow up on the announcement yesterday of his commitment to better understand voter fraud, faulty registration, etcetera,” Spicer told reporters aboard Air Force One on Thursday, CBS News Steven Portnoy reports. A day after Mr. Trump signed an immigration executive action targeting sanctuary cities, the Miami-Dade mayor dropped his city’s status as a sanctuary city.